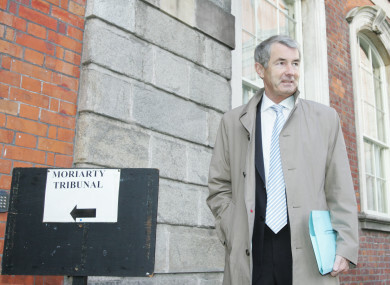 Former FG Minister for Communications Michael Lowry arriving at the Moriarty Tribunal in 2007. THERE WERE ACCUSATIONS of “mudslinging” today at an Oireachtas Committee meeting Taoiseach Leo Varadkar is attending. Varadkar told the Oireachtas Committee on Finance, Public Expenditure and Reform, and Taoiseach, that costs of the Moriarity, Cregan and Cook tribunals will overrun by millions. The Moriarty Tribunal kicked off in 1997 to look into the financial affairs of Charlie Haughey and Michael Lowry – and 22 years on, it continues to cost the State money. Officially called the Tribunal of Inquiry into certain Payments to Politicians and Related Matters, it took 14 years to find that former Fine Gael minister Michael Lowry had an “insidious and pervasive” influence over the awarding of Ireland’s second mobile phone licence in the 1990s to Denis O’Brien’s Esat Digifone company. Lowry is currently still a sitting TD for Tipperary. He rejects the findings of the Tribunal, as does O’Brien. Earlier this year, the Public Accounts Committee heard the tribunal would cost €65 million. Today, the Taoiseach said it will top out at €75 million – but he said this depends on the final cost of the bills. There were heated exchanges between Sinn Féin’s Pearse Doherty and the Taoiseach when the Donegal TD asked Varadkar whether he believed the Moriarty Tribunal was value for money. Varadkar said he thinks the tribunal did “very good work”, adding that some of its findings resulted in policy and legislative changes. Could the tribunal have done the same work for less money? The Taoiseach said “quite possibly”. Doherty asked the Taoiseach about whether he was happy relying on Michael Lowry’s government support, and also mentioned a recent meeting with businessman Denis O’Brien. The Taoiseach told the committee that Doherty’s questioning was just “mudslinging”. “I bumped into Denis O’Brien in a corridor in Davos,” he said, adding that the questioning was “ridiculous”. Varadkar shot back at Doherty, asking him if he was concerned that there are people sitting on the Sinn Féin benches who have “very serious criminal convictions”. Doherty said he was the one asking the questions at today’s committee hearing. Referencing the Cregran Tribunal – which is the investigation into the sale of certain loans held by IBRC, the former Anglo Irish Bank, including the controversial Siteserv deal – the Taoiseach said costs will also increase. To date, it has cost €7 million, however, Varadkar said he expects it to cost around €30 million. He said it is difficult to give a final figure on any ongoing investigation as there is no end date in sight. The Cooke investigation, which is reviewing Project Eagle, Nama’s sale of Northern Ireland-linked loans to US company Cerberus, for €1.6 billion, has cost €2 million. The tribunal is due to report in June. Varadkar said he had no reason to believe that an extension would be sought. The Taoiseach said he expects it will cost around €10 million. In giving his predictions, he was keen to point out that they are estimates. He said the cost of tribunals is something “we should all bear in mind”, stating that there isn’t a week that goes by that the opposition isn’t calling for a tribunal to be set up into a matter. Varadkar said while the calls may be merited in some cases, politicians have to remember that these inquiries don’t often provide the answers that are being sought, and ultimately it is the taxpayer that pays. Fianna Fáil’s Barry Cowen said that many of the tribunals and the matters they investigate are warranted. Email “Taoiseach slams TD for 'mudslinging' as he confirms tribunal costs will overrun by millions”. Feedback on “Taoiseach slams TD for 'mudslinging' as he confirms tribunal costs will overrun by millions”.